The initial gallows on the You are not allowed to view links. Register or Login to view. has a striking decoration. Folio: You are not allowed to view links. Register or Login to view. Colophon: Ricardus Franciscus Scripsit Anno domini 1447. On folio 42v, a counterclockwise rotation is performed. This is not possible otherwise because of the line spacing. Does anyone know other examples? Yep, quite a few. No time to look them up and post them right now, but I wanted to point out the "th" in your example. Notice how it sort of resembles a "y" but it's not? I have often wondered if the dangling character in "y ven mus mel" is the thorn character. I've mentioned this before but there wasn't any response, so I don't know if people think it's a good idea or a bad idea. Thorn originally looked more like a Y-shape and then a P-shape, one stem a bit more rounded but, as time wore on, it became more like a "y" shape again (and there are some that are in-between like the one in the VMS). Some of the early printed books use "y" instead of a real thorn char. It was commonly used as an abbreviation for "the" and the superscripted "e" was not always included, so if it's thorn in the VMS, it might represent "the" or it might be a reference letter. One of the other reasons I thought it might be thorn is because one of the possible interpretations of "ven" is a swelling or tumor and this is a northern word. 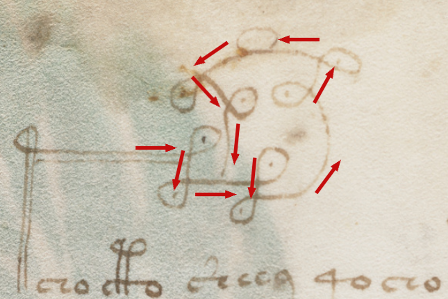 If the marginalia is both thorn and ven-as-swelling then the writer probably grew up or learned to write on the northern continent (e.g., Saxony) or in England. For a long time I thought "y ven mus mel" might be the same handwriting as 116v and 17r (especially since it almost reads as German) BUT after studying them for years and years and becoming very familiar with the letterforms, I now have some doubt. I still think 116v and 17r are the same scribe, but "mus" is written with a differently shaped "m" and a different final-ess which means it might be a different hand. I'm glad bi3mw you put this post about f42v. I was going to write of it too, but in another different sense. The rotating decoration on the gallow in this folio is part of the more general gallows coverage. For me this coverage is another clue that the script is an astronomical code with iconic symbols. In many cases the gallow extends between benches for marking a certain position of the Sun and Moon in the Ecliptic. In You are not allowed to view links. Register or Login to view. there is only one loop but in You are not allowed to view links. Register or Login to view. there are some loops in counterclockwise rotation with a point in each center.This is an iconic depiction of the Ptolemaic system, of the Sun's epicycle. The Sun spinning around the Earth depicts these loops. Sorry bi3mw if my post is not what you expected, but I had to say something what I am convinced. I think Ellie V posted some examples quite some time ago. I don't know if the one above is one of the ones she included. I found it independently while sampling scripts. Dotting the loops like that isn't extremely common in my experience. It might be worthwhile to track the region where this was done. The example I posted is from a manuscript that has excerpts from the gospels. Munich. I sampled it years ago, but if I remember correctly, it's Cgm 96? (15-12-2018, 02:26 AM)-JKP- Wrote: You are not allowed to view links. Register or Login to view. The example I posted is from a manuscript that has excerpts from the gospels. Munich. I sampled it years ago, but if I remember correctly, it's Cgm 96? Yes, it is BSB Cgm 96., You are not allowed to view links. Register or Login to view. . - Munich, Püttrich-Regelhaus (Monastery, Franciscan nuns), 15th century. Title: (ger): "Das Leben der Jungfrau Maria, nach den Evangelien und den Kirchenvätern betrachtet. Traktat über gerechte und betrogene Andacht." Title (engl. ): "The life of the Virgin Mary, considered according to the Gospels and the Fathers of the Church. Treatise on just and betrayed prayer." OT: I stumbled upon an interesting article on "Medieval Flowers of the Madonna". You know, I can't remember names to save my life. I'm really bad at it. But sometimes I can remember numbers for years and years (depends how tired I am). I can remember my credit card numbers without even trying, and the phone numbers of all my childhood friends, but I can't remember song titles no matter how hard I try, or names of people I've just met. Thanks for posting the link bi3mw. For the sake of completeness, You are not allowed to view links. Register or Login to view. is the link to the blog of Ellie Velinska you mentioned. GAUTIER DE METZ, Image du monde, Français 14965, 1401-1500, You are not allowed to view links. Register or Login to view. Maybe this is a bit off-topic, but I have a question seeing this really complex decoration. I think there might be three solutions. These are merely decorations, not letters, so they do not have to be precisely recognized. The last stroke, or some other details, of the decoration determines whether it is EVA-p or EVA-t.
EVA-p and EVA-t are actually one same letter that does not have to be distinguishable.